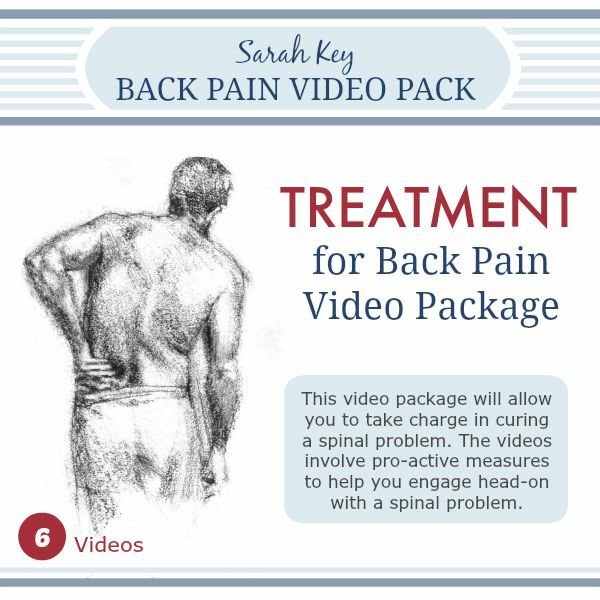 This downloadable back pain treatment video package will allow you to take charge in curing a spinal problem. 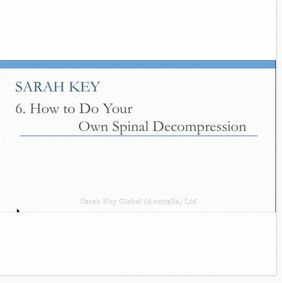 They involve pro-active measures to help you engage head-on with a spinal problem, helping to push through your natural hesitation and making you do new and important things. Most chronic back problems can go straight to this stage, although it is always good to view the appeasing videos as well, in case you create a treatment reaction and stir up additional pain (this is normal enough but if you expect it, and know how to deal with it, you won't be alarmed). Believe it or not, no matter what the diagnosis, curing a spinal problem involves gentle spinal decompression, for pretty well every condition. Decompression, or traction, separates the spinal segments that have become squashed by gravity and muscle tightness, making it easier for the discs to circulate fluid. 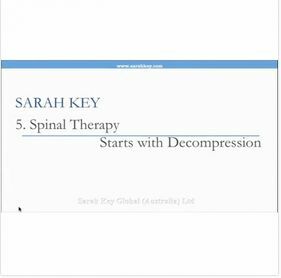 At 46MB and 20 minutes Spinal Therapy Starts with Decompression is the most important video in this package of back pain treatment videos. This video shows Sarah down on the floor talking you through and showing you exactly what to do. You will see her going through the all-important 3-step 'pressure change therapy' regime using the famous BackBlock. You will be struck how gentle and unhurried the whole process is; how less is more. The file is 72 MB and runs for 30 minutes. Many people with back problems are frightened of bending. This makes matters worse. The muscles get weak and the back gets increasingly fragile and more easily provoked. Here Sarah explains how the penalty of our upright stance is that we must bend to pull more fluid back into the discs. She explains that bending gives the discs a drink, and it's this that keeps them well nourished. This video is 34MB and runs for 15 minutes. Of course with all the fear of bending in the world of bad backs, it's important to show you how it should be done properly. 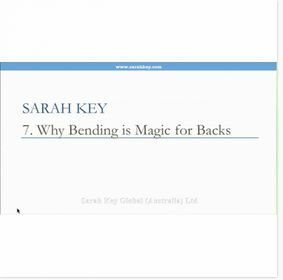 (Sarah says the main reason she regards Pilates is their sanitising bending by teaching 'curl downs'.) In Sarah herself shows you bending by pulling the tummy in first. She also shows you how effective squatting can be to pull the spinal segments apart. This file is 14MB and 6 minutes long. With treatment to cure a spinal problem using a BackBlock you need to look after the upper back too This is not only because many people suffer separate thoracic or rib pain, but because a posture of the upper body stooped forward can be part of the genesis of a lower back problem. This back treatment video is 25MB and runs for 11 minutes. These back pain exercises exert traction on the lumbar nerve roots to help free them from tethering to the walls of the bony tube through which they exit the spine. This back pain treatment video is 24MB and runs for 30 minutes.